Rhianna McLeod really needs a job, so when she is asked to come to Miami to be the nurse of JT Lance, she is relieved. JT is dying from a brain tumor and is given six months from his doctors. Rhianna quickly bonds with him, finding security and home for the first time in her life. Rhianna's parents were killed in a car crash when she was born. Afterward, she was sent to live with relatives, but when the perished, she was put into the foster care system. She spent a few good years with a couple of families, but then was given to the Waverly's, a place where she could be potentially adopted. Unfortunately, the Waverly's didn't want a daughter, but a maid and someone for Mr. Waverly to abuse. Rhianna still has her nightmares of those years with the Waverly's and it has handicapped any romantic involvement. But JT wants Rhianna to savor life, so he sends her on a vacation for her birthday to an island for a few weeks. He feels it will do her some good. She doesn't want to leave her safe environment, but she will do it since it makes him happy. Jonathon Tyler doesn't understand how this city slicker woman ended up on his private island. But, as there is no boats or radio available, he is stuck with her for at least six weeks. His deaf daughter, Misty, lives on the island as well as his two caretakers. When he larns that Rhianna can teach sign language, he hires her to teach his daughter. He spends his days painting in a small cabin, but he can't get her beautiful face out of his mind. Jonathon and Rhianna try to deny their attraction to one another, but they can't. However, their emotional past will have to be overcome if they want any future together. Jonathon is estranged from his father, so there is no one but him and Misty. Rhianna can't get past her brutal childhood to trust Jonathon. But one evening, during a passionate interlude, Jonathon spies the photo on Rhianna's bedside and all hell breaks loose. Why does she have a picture of his father on her nightstand? The next morning, she is cleaning the library and sees some old photos. Why does Jonathon have a picture of her mother? They need answers, and fast before assumptions turn their relationship ugly. But a sinister and evil man is on his way to claim Rhianna for his own. 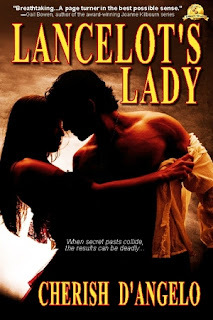 Will Jonathon listen to his heart and save her before it is too late? 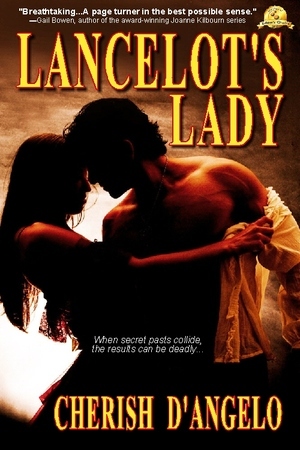 Lancelot's Lady is a compelling and emotional tale of two people destined for one another. The suspense builds and builds until the stunning and shocking conclusion is revealed. D'Angelo pens a wonderful story of two passionate souls searching for someone to complete them. 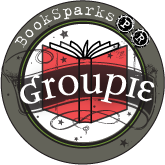 The sparks fly and the attraction sizzles between Jonathon and Rhianna, and the pages just fly by as this reader found herself captivated with their story. I absolutely loved it!! Cherish will be here tomorrow so make sure you come back to chat!!! I lost count as to how many blogs I have hit!! lol This is fun!!! I am enjoying finding all sorts of new blogs to follow!! Love the review. It definitely makes me want to read the book! Sarah, I've lost count of how many times you've stalked me. hehe Thank you. I'm glad you're enjoying the tour. When I was about 8, I played Eeyore in the school play. My mother sewed my costume, a one piece outfit made of thick gray material--velour maybe. It had a hood with floppy ears. My tail was pinned on with a big kilt pin. And I had gray makeup on my face. I nearly boiled to death in that costume (thanks, Mom...hehe). I had to speak in a low voice. And I had to sing--a solo. I still remember that performance--one of the highlights of my youth. Hi there! I'm a new follower, following you from Hoppin' Weekend! Very nice blog! Please stop on by, thanks! I think I'm a gonna have to get this book! okay have to admit I skipped a big portion of this because of the spolier alert. I want to read every page ;).